BAGHDAD, Iraq, June 30, 2010 (ENS) – The interim Iraqi government is reeling from riots and demonstrations that have erupted across the country to protest severe electricity shortages, as summer temperatures soar. Anger has been growing for weeks over the continued power cuts and rising fuel prices, resulting from the demand for generators, and the stalled efforts to form a new government. The electricity shortages mean that Iraqis, swelterng in temperatures of over 50 degrees Celcius, have limited access to air conditioning. At least two demonstrators were killed June 19 in the southern city of Basra when security forces opened fire on a mob enraged after electricity was reduced to less than two hours per day. Seventeen policemen were wounded in Nasiriyah on June 22 when hundreds of protesters clashed with riot troops outside provincial administrative offices. 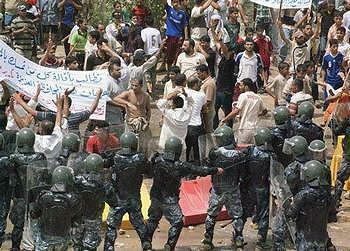 Protests have become an almost daily occurrence in some poor neighborhoods of Baghdad. The crisis saw its first political casualty on June 23 when the embattled electricity minister, Karim Waheed, handed in his resignation to caretaker Prime Minister Nuri al-Maliki, whose own bid for a second term has now been cast in doubt. “The fact that we still have so little electricity after all these years makes people think the government has done nothing for them. Maliki was counting on his security achievements to guarantee him the prime minister position again, but these demonstrations are a message the security alone is not enough. You have to deal with the needs of the people,” said Ibrahim al-Sumaidaei, a lawyer and political analyst in Baghdad. 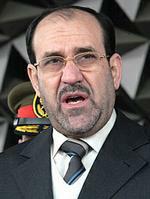 The crisis comes as Maliki and other leaders try to cobble together a coalition government, more than three months after an inconclusive national vote. As public anger intensifies, Maliki and his team have called for calm and patience. “Neither the ministry of electricity nor the government has done anything wrong; both are doing their job. All that happened is a delay in our plans to boost electricity due to lack of money because of the international financial crisis which has hit the whole world, not just Iraq,” said Thamir al-Gadhban, head of Maliki’s cabinet and the prime minister’s oil adviser. Another Maliki adviser, Ali al-Mosawi, said the government has taken unprecedented measures to alleviate the blackouts that have reduced power in some parts of Baghdad to about an hour each day. Millions of Iraqis are forced to live with less than six hours of electricity per day, according to government estimates, and most cannot afford to purchase or operate a fuel-burning generator. 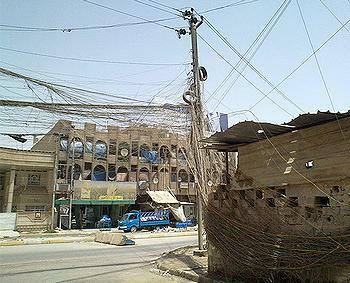 “The government is doing its best to provide as much power as it can for Iraqi citizens. We are now cutting off electricity to all officials’ homes and government institutions in the Green Zone so that power will go instead to the Iraqi people,” Mosawi said. The Green Zone is the heavily protected government compound in Baghdad. The government said it spends roughly US$3.5 billion on electricity generating and infrastructure projects each year. Deals to build power plants and improve Iraq’s faulty electricity grids have been signed with international corporations General Electric and Siemens, but the results are years away. Figures released by the U.S. Embassy show demand for electricity is at an all-time high. Officials and experts say there is no quick way to meet the increased demand. As the electricity crisis unites Iraqis across sectarian and social divisions, politicians who campaigned on promises of improved services have been left scrambling to appease the public. “Most of the candidates in the parliamentary vote diagnosed correctly that the electricity shortage is the main problem in Iraq. All political parties and blocs said the problem needed a radical solution. They ran their campaigns around offering to solve it, but nobody ever detailed how they were going to do it,” said Khalid al-Asadi, a senior member of the State of Law alliance. The government has also come under fire for hiking electricity rates on June 1. According to Adnan Rehayma, a member of the Union of Electrical Professions, the cost for an average household has doubled. The U.S. government, which has invested 4.6 billion dollars in rebuilding Iraq’s electricity sector, claims electricity production is up 50 per0cent from 2003, but still can’t keep pace with demand. The United States has said the energy crisis has reinforced the need for political stability. “The dissatisfaction of some citizens with the intermittent supply of electricity points up the need to form a new government quickly so that [it] can focus all its attention on providing essential services to the Iraqi people,” said U.S. Embassy spokesman Phil Frayne. Meanwhile, ordinary Iraqis are losing patience with the authorities. In the Bab al-Moadham district of central Baghdad, housewife Um Abdullah tries to raise her family on two hours of electricity per day. “I’ve heard all the promises from the government about giving us electricity. They’ve been saying all this for years. This government should just give up and admit they can’t provide us what we need to live,” Abdullah said.